I was honored with the task to review book 7 of the Artemis Fowl series and a preview of book 8 – The Atlantis Complex and The Last Guardian for netgalley.com. Book 7 finds Artemis with a change in his personality, both good and bad. He now wants to help the fairy community and save the world, but he has contracted Atlantis Complex which leaves him highly paranoid of those around him and the number four which he equates with death. Artemis has called a meeting in Iceland with key fairy people, including Captain Holly Short and Foaly, to discuss an invention of his that will help with the global warming. The Atantis Complex is full of intrigue, danger, and excitement. Artemis’ genius is stretched to the limit with solving the latest caper while he is suffering with paranoia, another personality that emerges, and the fear of the number four. He had sent his faithful bodyguard Butler on what he thought would be a goose chase but turned out to be part of the overall caper and danger. By the end of the book, of course all is well with Artemis but his old nemesis Opal Koboi is re-emerging to wreak havoc on both the human and fairy worlds which leads to the final book. The Last Guardian introduces another facet of the fairy world. A very dangerous facet. Opal Koboi is set to unleash this danger upon the human and fairy world. Will Artemis save both? Will Opal succeed? Readers will have to purchase the book to answer those questions. I reviewed this book free for review from netgalley.com. 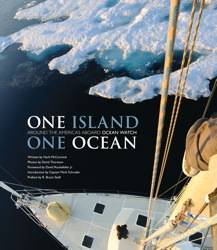 Mark Schrader, captain of OceanWatch, and a team of scientists, a writer, teachers, sailors, and conservationists circumnavigated the Americas between 2009 and 2010 beginning in the northwest. The purpose of their journey was to educate children, youth, and adults about the similarities of our living space and how our actions affect that space. The team sailed around North and South America in the 64-foot vessel making stops for educational forums for school children. In addition, Herb McCormick live-blogged the adventure and wrote One Island, One Ocean as a permanent memorial and academic medium. The journey took thirteen months to complete beginning May 2009 and was timed to navigate through the Northwest Passage during the northern hemisphere’s spring/summer when the ice would be less of a danger and around the tip of Cape Horn during the southern hemisphere’s spring/summer when the winds and ice were less of a danger. The message that the team wanted to broadcast is that the way we use and utilize our community and continent affects more than just one area. It impacts those who live thousands of miles away because we share one ocean. It impacts human, plant, and animal life. Our actions are depleting the ice which impacts the continent in rippling effect. Each action ripples and affects another aspect of the environment. The photographer, David Thoreson, compiled a breathtaking array of photographs from the journey. This book is a must-have for anyone’s library! I received this book free for review in ebook format from netgalley.com.